Keeps the relative humidity inside of the box at a range of 88-95%, which diminishes the loss of weight of the fruit. Sanitizes wounds and microcracks on the fruit surface, maintaining its condition. The Berry Guard™ SO2 pad is adaptable to multiple box sizes. It can prescind from Controlled Atmosphere devices for its effectiveness to port of destiny. Quick and easy to mount avoiding temperature breaks during the operation. Berryguard pads are devices compounding coated laminated polymers which stably control SO2 emission applying a very low dosage of this gas to the fruit with the purpose of stopping the action of Botrytis Cinerea fungus. It can be adapted to up to 4 types of packaging sizes and perforations are precisely designed to facilitate the adequate ventilation and gas emission inside of the box . The density of the plastic barrier and the specific particle size of the active ingredient Na2S2O5 allows an homogeneous and stable release of sodium metabisulfite during transit and/or storage of fruit . 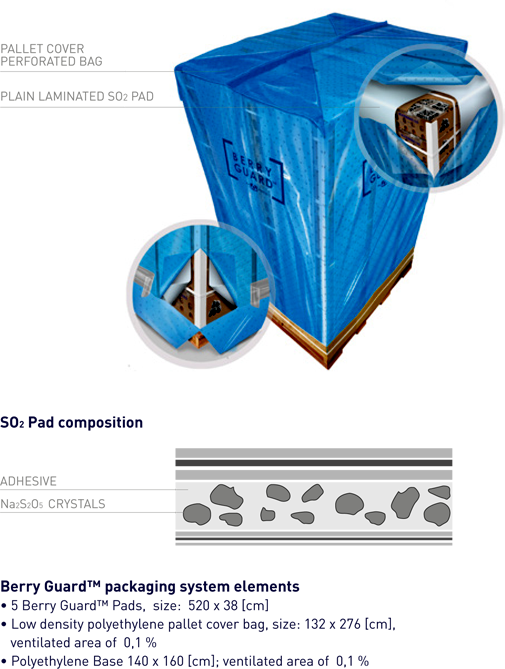 The box to box Berry Guard ™ system is a different and innovative application of the SO2 generating device in blueberry transits and/or storage with excellent results in both clamshell and bulk shipments. 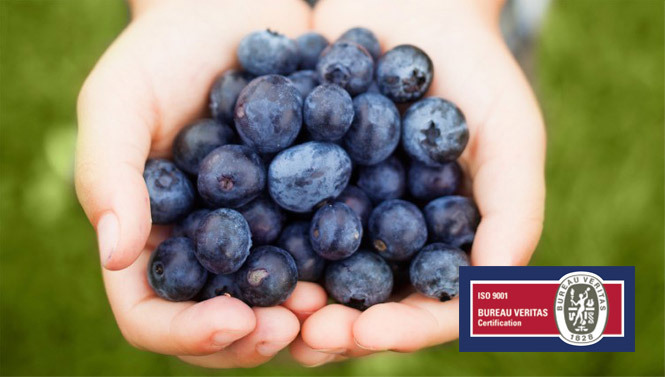 Berry Guard™ is an innovative packaging system developed by OSKU and validated by Davis, University of California and important Chilean Blueberry Export Companies. 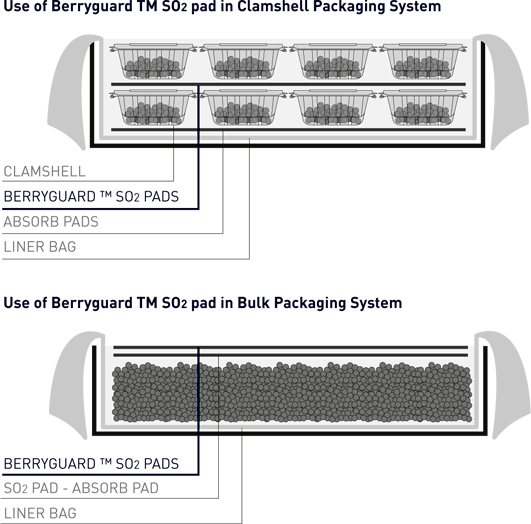 The system comprises a pallet-cover bag controlling the relative humidity and 5 bands of pads releasing Sulfur Dioxide (SO2) which together effectively control the development of Botrytis Cinerea on blueberries. The product allows extended times of transit and/or storage. Berry Guard™ pads are devices that are composed of laminated covered polymers which stably control the SO2 emission by applying very low dosis of gas to the fruit with the purpose of stopping the action of Botrytis Cinerea. 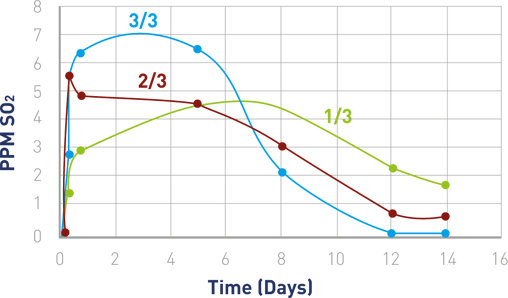 Diminished loss of weight on the blueberry, keeping the relative humidity stable in a range of 88-95%. Sanitizes superficial wounds and microcracks in the fruit, keeping its optimum condition. Operatively easy and quickly to mount avoiding temperature breaks.